All scientific disciplines prize predictive success. Conventional statistical analyses, however, treat prediction as secondary, instead focusing on modeling and hence estimation, testing, and detailed physical interpretation, tackling these tasks before the predictive adequacy of a model is established. 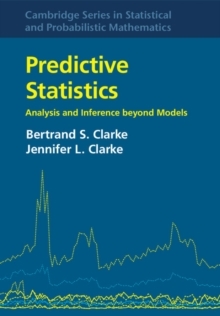 This book outlines a fully predictive approach to statistical problems based on studying predictors; the approach does not require predictors correspond to a model although this important special case is included in the general approach. Throughout, the point is to examine predictive performance before considering conventional inference. These ideas are traced through five traditional subfields of statistics, helping readers to refocus and adopt a directly predictive outlook. The book also considers prediction via contemporary 'black box' techniques and emerging data types and methodologies where conventional modeling is so difficult that good prediction is the main criterion available for evaluating the performance of a statistical method. Well-documented open-source R code in a Github repository allows readers to replicate examples and apply techniques to other investigations.